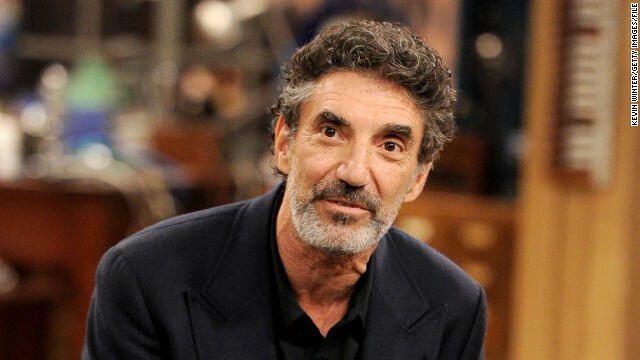 Never say Chuck Lorre doesn't come prepared. The co-creator of "Two and a Half Men," "The Big Bang Theory" and CBS' new comedy "Mom" arrived at the Emmy awards on Sunday knowing exactly what he would do if best comedy nominee "Big Bang Theory" grabbed the win. First, he would remind himself to breathe. But had voters gone with "The Big Bang Theory," which bowed with its seventh season on Thursday, Lorre might've been moved to tears. "Breath! Don't Cry!" his speech card begins. The notes also include the general groups of people he'd better not forget to thank, including the fans. Had such a win been pulled off, Lorre would have acknowledged in his speech that it had happened because "BBT" has "the greatest cast, crew (and) writing staff EVER!" Plus, they had Bob Newhart, who won his first Emmy with a guest appearance on the CBS comedy in May. What do you think - was Lorre sharing the speech he never got to say endearing and honest, or sour grapes? BBT has brilliant writing and a brilliant ensemble cast. I always laugh when I see people whining about how much the characters have changed. LIFE IS CHANGE. Can you honestly tell me that the show would remain successful if Leonard and the gang were STILL single and desperate? If the formula had NOT changed at all, and it was the same thing for seven seasons (i.e. Howard being a womanizer, Raj unable to talk to women, Leonard still chasing Penny)? No, it wouldn't be. It would be tale and boring. Just as people do in life, the characters have grown, developed and evolved. It remains one of the most popular sitcoms on television. Deal with it or quit watching it. The EP In Group Is Atttached..
As far as pure comedy goes, "The Big Bang Theory" is far and away the best. Nothing even comes close. I love "Modern Family," but it's almost a dramedy, and at times almost preachy. It's hard to compare the two. I was disappointed with the season premiere. The show is running out of steam...and fast. Even the actors seem bored with their roles.I think this may well be the final season as more and more viewers migrate to other shows. Really? They had their biggest season opener EVER and, I believe, the biggest audience of any comedy season opener this year. "The Big Bang Theory easily won its time slot and the night as a whole to finish as the night's most-watched and highest-rated program. Throughout the hour, The Big Bang Theory had more viewers and a higher rating in the 18-49 demo than the other four networks combined. The Big Bang Theory is also the top performing show in the adults 18-49 demographic of the entire week." The problem with the internet is that every moron can get on here to spout unsupported nonsense. I very much disagree. Sometimes you're not in the mood to laugh, and other times you just don't understand that gag. If your sense of humor moves beyond the show, just move on, but don't blame the rare collection of immense talent gathered on the cast and crew of BBT because the majority of 20+ million viewers from this past week will likely disagree with you. Lorre's extreme talent is only dwarfed by his extreme ego. Ever take the time to read one of his long-winded rants at the end of the credits? I rest my case. not our problem--she is still under and impression we do not read cnn from the "outside"
I liked the show for the first three seasons. Then they decided that the geeks needed to be "fixed" and made normal. I find it almost unwatchable at this point. Between the dumbing-down of the characters and the predictable rhythm of set-up > punch-line > overboard audience laughter... I just can't stand it. The Big Bang hits hard but it is not the best comedy on TV. It is good stuff because the landscape is easy to conquer! Give it props for being good but dont over approve it. Enjoy it for what it is. Funny stuff sometimes!mI like to watch it sometimes as a lot of folks do. Well its better than Modern Family. Modern Family isn't that funny of a comedy show in my opinion. I don't get why it keeps winning Emmys every year. you have no legal contract.. ..the kardashians are actually higher level then she is. the gay guy makes the whole show....the women are of no challenge. Modern Family has two gay guys, which is why it wins every year. The show was never an actual thrill too me especially with poor influence. I agree....the show lost momentum. there is only so much of the boring actresses in the big bang theory we find a ray of excitment. The 2 actresses are not what we call quality tv anymore and they are too old for the parts. The show has run its course. It was cute for awhile now its the same boring format. I have seen people sit on the couch watching reruns of this show all day....and why? lousy scripts....ny scripts are much better. You realized your in a hacked machine right? Love all Lorre's work. Helps to overcome the "Kartrashion" crap. women with spark, young or old...we do not want too follow this and we will never follow her rants of trash and bologna. she is only in the hacked stuff. experience project.....bloo–she's a bimbo...i hear you laughing from here. She erased the email stating i could log in--printed and faxed. I think it is sweet that he posted his speech. He is proud of his show and wants to thank all of the people involved, and this way he got to do it. Most people don't have that opportunity. We love The Big Bang Theory, but don't understand why only Jim Parsons get nominated every year as best actor. There are 4 very talented actors on that show and the other 3 are easily as talented as Parsons. What gives? I must be a Lorre fan, as BBT and the original 2 1/2 men are the only sitcoms I've enjoyed since Seinfeld, and I thought Mom, with Anna Faris, was hilarious in it's series premiere thursday evening. There was a cdn sitcom called, Corner Gas, that was also very funny. GHJKGHGHJFGJHGJHGGH on What are you watching on TV Sunday? I love this show as much as Two Half Men (with Scheen) but for completly different reasons. Didn't realize the same guy had his hands in both shows. To me these are the best shows since Seinfeld. I cut off the Emmy's after the first award. When Mayim Bialik did not win best supporting actress, I figured the rest of the awards would be pretty much BS too. With few exceptions, the same people and shows get nominated every year and the same ones win. It's really boring. Don't sweat it. The Emmys are little more than a popularity contest and an excuse for a party. Look at Bob Newhart for example: he's been a regular in several of the best shows produced in the last 50 years, yet he just received his first award for a small guest role. I've tried watching modern family many times but can't take it. Big Bang Theory a MUCH better show than modern family by a LONGSHOT!! I know. I'm bored to tears with Modern Family... I just don't get its popularity. My feelings exacly ,I do not understand what people see so much in that show,it is not a bd show,but nothing to compare with BBT,I think that it ius the last year that they will win though. 2 and a Half Men is the worst US sitcom of recent history. BBT started of well, but is getting really tired, and newer characters and storylines are far from memorable (Raj's girlfriend is tedious at best). Modern Family is in a different league. He shouldn't have even bothered turning up for the ceremony – it would have been an almighty travesty if he had trumped Modern Family, the best comedy since 30 Rock's golden years. big bang is the best comedy on tv right now by leeps and bounds. I would have put my foot through the TV if it had one. The show is nothing but recycled storylines and plays on embarrassingly overblown stereotypes and trivializes a very serious mental disorder. It is typical CBS garbage that just plays down to the lowest common denominator. I can't believe someone just compared this to Seinfeld. BBT, as all such network shows, should have ended after 5 years, no later, possibly sooner. Seinfeld never was funny. Clearly you are in the minority or just not intelligent enough to get the jokes. Don't worry, there are plenty of reality shows available for you to watch. It is won, not one! Lorre's vanity cards at the ends of the shows are freaking hilarious. Strongly recommend pausing the DVR and reading them. The man is a genius. I like my big bang theory show. I say "endearing", I know I would have cried if they had won. Nothing taken away from Modern Family, but BBT ranks right up there with Seinfeld and Friends as all time best comedy show.